Not everyone is enjoying the heat. WHILE THOSE OF us on dry land may be enjoying the heatwave, the public has been asked to think about those in the water. Inland Fisheries Ireland (IFI) is asking anglers and the general public to report any sightings of distressed fish which may be caused by high water temperatures and low water levels. The body is also asking anglers to avoid using “keep nets” in order to avoid causing distress to fish. IFI has a 24-hour hotline for reporting distressed fish: 1890 34 74 24 or 1890 FISH 24. 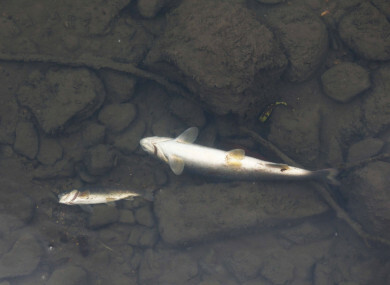 IFI also says that there is a reduced amount of oxygen in the water due to the heat and is asking farmers and industry to be mindful that discharges to rivers and lakes, such as silage effluent or sewage discharges can put additional demands on the oxygen levels, resulting in pollution incidents and fish kills. Landowners are also asked to mindful when taking water from lakes and rivers. Email “Public asked to keep an eye out for distressed fish during heatwave”. Feedback on “Public asked to keep an eye out for distressed fish during heatwave”.